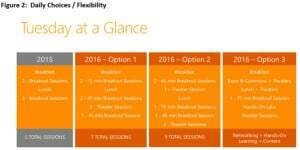 HomeMicrosoftMicrosoft Ignite Breakouts: Is shorter better? Microsoft Ignite Breakouts: Is shorter better? According to a request for comment on the IT Pro network on Yammer,from Michael Kophs, the team planning Microsoft Ignite this year is considering adding shorter breakout sessions to the mix. When it comes to Ignite sessions, is shorter better? In Chicago, sessions were the traditional 75 minute length, and they all started and ended at the same time on the schedule. That meant that all 20k attendees were on the move at the same time as they moved between sessions. McCormick is a big convention center, but I think we all experienced the resulting congestion more than once during the week. In response to that congestion, the Ignite team is proposing that a new 45-minute session format be added along with more theater sessions. In addition to the shorter length, the start times would be staggered to reduce the number of people in the hallways when sessions end. 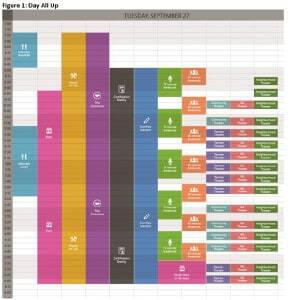 Two suggested schedules were included in the show how this might look over a typical conference day. Analysis of other industry events shows shorter sessions are trending. I’m not sure, however, that sizing the session to be a better online experience is a reason to make the change. Ignite is first and foremost an in-person event. Maximizing that experience should be the top priority. If a change accomplishes that and makes things better for later viewing, that’s great. Don’t do it at the expense of the on site experience. I haven’t been to any conferences that use a 45-minute session before, so I’m not sure how well this format works. They cite the trend of shorter sessions, but I’d be more interested in the attendee satisfaction trend for those events. Just because everybody is doing it, doesn’t mean Microsoft should too. That was the thinking behind super-sizing Ignite, and I think the jury is definitely still out on that one. Even with my concerns, I’m open to giving it a try. This will be my 15th consecutive TechEd/Ignite event, so the standard format is familiar and has worked well for me so far. I would hate to stifle a good idea though simply because it’s different. I would like to see them try it out, however, at another event first perhaps. All three of the other major conferences – Build, Envision, and WPC – happen before Ignite this year, so perhaps they can kick the tires there if possible, and see how things go. I know the events are all independent of each other, but any opportunities to leverage the experiences of the other is a smart move. If you want to chime in and let Microsoft and the Ignite team know what YOU think about this idea, go add your feedback to the thread on Yammer. If you’re not logged in to Yammer in the browser where you open that link, it’ll take you to the default page for the IT Pro network. Logon to Yammer and hit the link again; it will take you directly to the thread. If you’re not a member of the network, you should join. I know some people out there are skeptical when Microsoft asks for opinions about changes like this. One comment on Twitter was “I think they want justification, not discussion.” That’s definitely a possibility, but I like to give people the benefit of the doubt. That may make me naive, but what’s the harm in giving your feedback? If the request is sincere, then you can help shape things. If the request isn’t, at least you tried. Who knows. Even if they are set on doing a certain thing, if enough people raise valid issues, they just might listen. So what do you think of this idea for shorter breakout sessions?